When the Annie's acquisition was announced in September of 2014, no one on staff at Annie’s was prepared for the onslaught from concerned consumers. “The internet threw up,” explains industry analyst and food advocate Robyn O’Brien, “This big guy has just come and taken our sweet Annie’s.” Customers were worried that the acquisition was a sell out and that Annie's commitment to organic, healthful, natural ingredients would be abandoned. “Within 4 days we had 30,000 consumer comments on social and via customer relations by phone and email,” Keely Fadrhonc Senior Marketing Communications Manager at Annie's Inc. told me. Most of them expressed concerns about what the acquisition would mean for the brand. From the beginning, Annie’s has been a brand for moms. 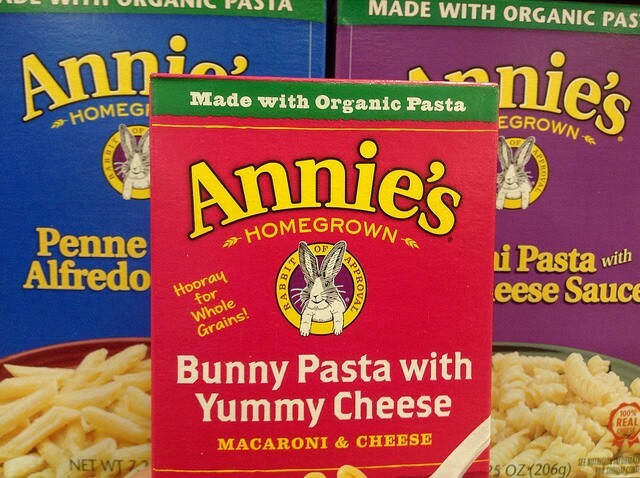 Annie’s customers' passion are part of what make the brand successful – these moms care deeply about the ingredients in their children’s food, especially artificial dyes and flavors and GMOs. While Annie’s saw the acquisition as a “win win win” because it would allow the small potatoes food manufacturer to grow, expand new lines and bring its products to new customers through mainstream outlets like Target and Walmart. Customers didn’t exactly see it that way. They had a reason to be concerned. When General Mills bought another beloved brand -- Cascadian Farms -- the sugar content of a product tripled. But Annie's had no plans for changes. The Annie's team knew they needed to show rather than tell to really assuage the worried customers. "We realized the anger was coming from a place of love," explained Foraker. In the past year, the company has been hard at work on integration. The team is now just starting to come up for air and describe how the aquisition will further Annie's goals. In a vision document Foraker created with Steve Young, Vice President - Annie's at General Mills -- his main liaison at General Mills -- the two outline the current food landscape and how this partnership will help deliver healthful, organic products with limited preservatives that today’s customer wants to buy. As for the partnership? It's a rousing success. Foraker says, “We have not been asked to compromise one single thing with ingredients, values or sourcing.” The parent and child companies even agree to disagree about GMO labelling. The appeal of this acquisition was the chance for General Mills to capitalize on the “seismic shift” in food preferences rolling out across the country: More interest in fresh food, health, nutrition and a concern about ingredients, preservatives and dyes. General Mills has a history of successfully adapting to the changing needs and desires of customers. Young, a 20-year veteran of the firm, says, "What has kept General Mills successful over the last century is its ability to pivot. We’re good at keeping our ear to the ground, giving consumers what they want. You can’t not see the interest in transparency and cleaner food." Given the shifting customer interest, the $820M acquisition makes great business sense and General Mills is wise to avoid messing too much with the success Annie’s has created. For Annie’s the acquisition meant more product lines, more outlets, more happy customers, and more kids eating healthful food they love. Foraker was adamant, “We’re not going to compromise. The goal is to expand impact and bring our products to more people. If you believe we’re going to screw up, I honor that, but watch us, hold us accountable." As the integration moves forward, Foraker spends more time in Minneapolis and Young in Berkeley. The goal is to shore up the Annie’s team and help them with resiliency, while increasing opportunities for the team to educate folks working on other brands in the General Mills portfolio. What’s next? To make this a billion dollar brand, one of only a handful of such unicorns in General Mills portfolio. This would reduce the cost of organic staples which would create ripples throughout the agriculture industry. With organics making up only 5 percent of the food market, they have a way to go, but General Mills is not taking things lightly. They’ve committed to doubling the number of acres of organic they purchase (from 5 million to 10 million) by 2020. If you see Annie's take a misstep Foraker would like to hear about it -- find him on LInkedIn -- but don't tease him too badly about the bunny ears. He's just keeping Annie's weird. Image credits: Mike Mozart, Flickr, Facebook screen grabs, Annie's Inc.